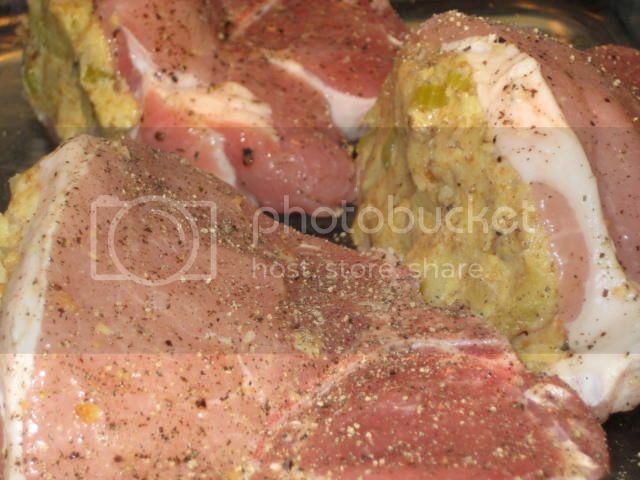 One of my favorite foods in the world is a good thick bone in pork chop. 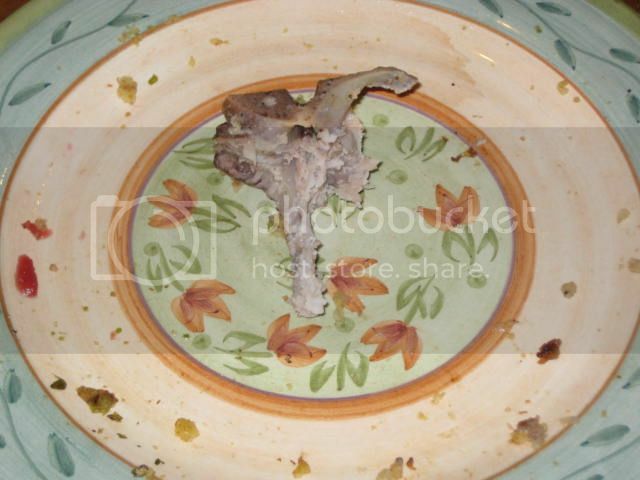 I'm not picky when it comes to how it's cooked, as long as I get to gnaw on the bone! So, I decided I wanted to stuff these chops and cook on the grill, but the weather has been ugly to say the least lately, so these were going to be cooked inside. Started off making a batch of corn bread (2- boxes of Jiffy Mix Brand) in my cast iron skillet, the perfect pan for cornbread!! 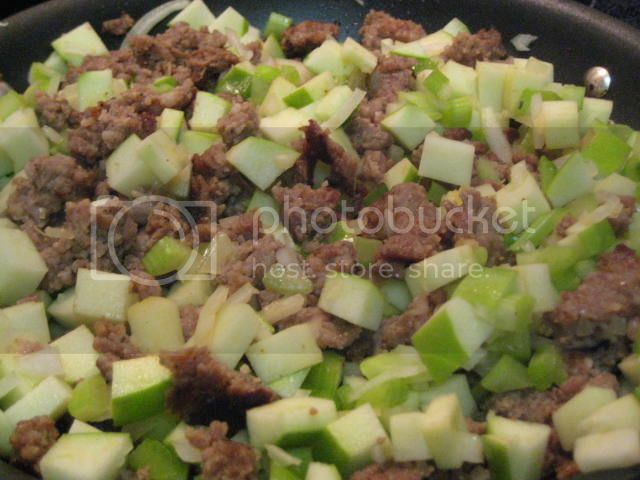 Then browned 1lb of breakfast sausage and sauteed 1 Granny Smith apple (diced), 1 medium yellow onion (diced) and 4 stalks of celery (diced) just until they began to sweat. 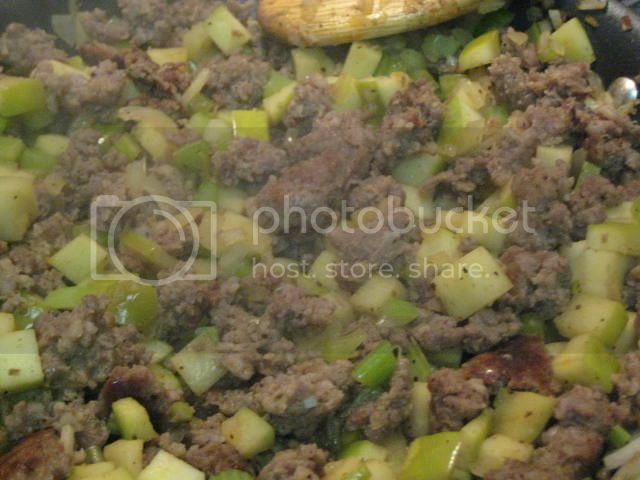 Then I crumbled the corn bread while it was still in the skillet and added the sausage, apples, onions and celery. I also mixed in a cup and a half of chick broth, salt, pepper and ground sage. 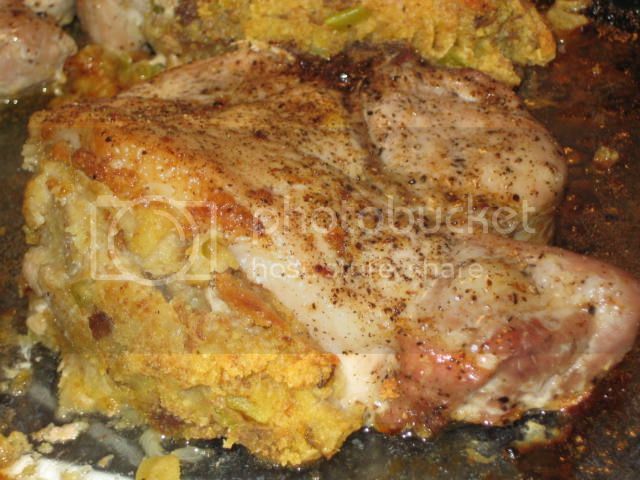 After the stuffing was done, it was refrigerated until it was time to stuff the chops. 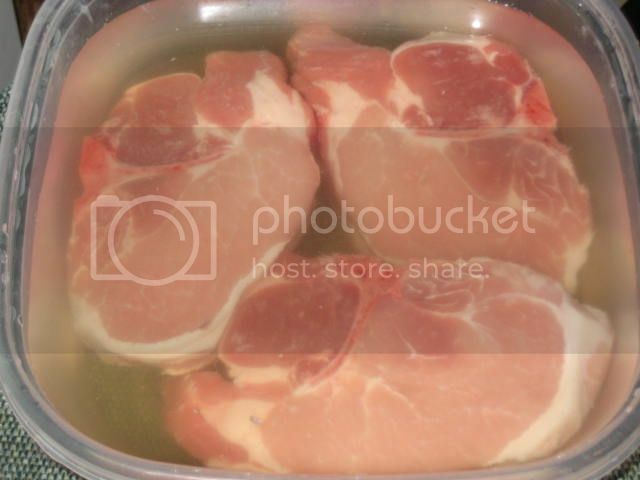 The pork chops went into a simple brine of 1 quart of water, 1/4 cup Kosher salt and 1/8 cup of brown sugar and brined for 3 hours. Time to stuff the chops. Butterflied the chops and seasoned with fresh ground pepper inside and out. 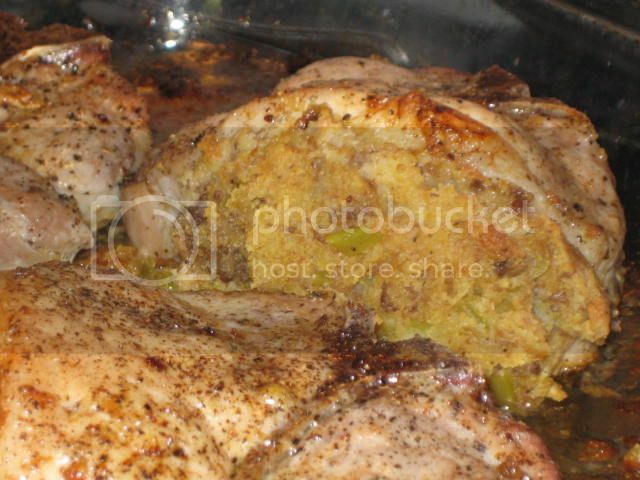 Added 3 TBS of butter to the dish and baked at 350º for 1 hour or until internal temp of pork and stuffing hit 160º. I basted about every 15 minutes with the butter. 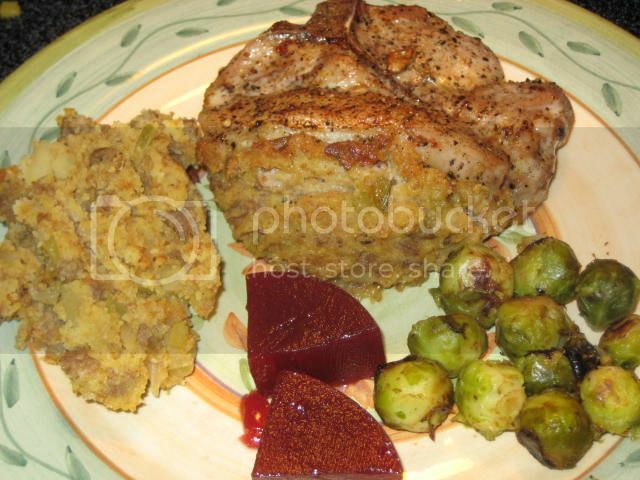 Dinner is served along with more stuffing, brussel sprouts and cranberry sauce. 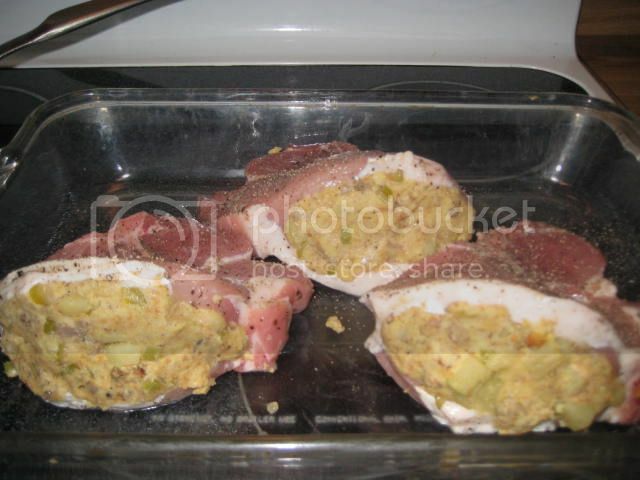 Now, THOSE are some stuffed pork chops if I've ever seen any! I'm moving to Virgin-I-A .. TODAY !! Making these tonight. However, I'm making them on the Performer, and I substituted the breakfast sausage for diced andouille. I also used more apple. Just waiting for the chops to finish brining. I got my chops cut 2" thick. They're big daddies. Can't wait to eat these ****ers. Hi, I found your REEEAAALLLY old post, while looking at sausage recipes. Specifically, I was looking for breakfast sausage caesar salad photos. 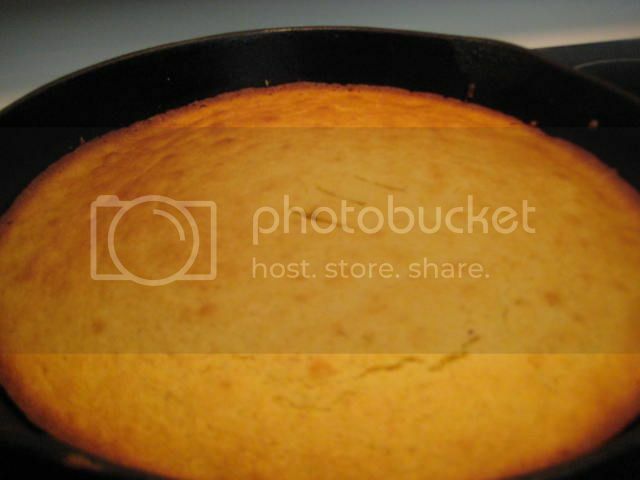 The photo of your cornbread came up for some reason. 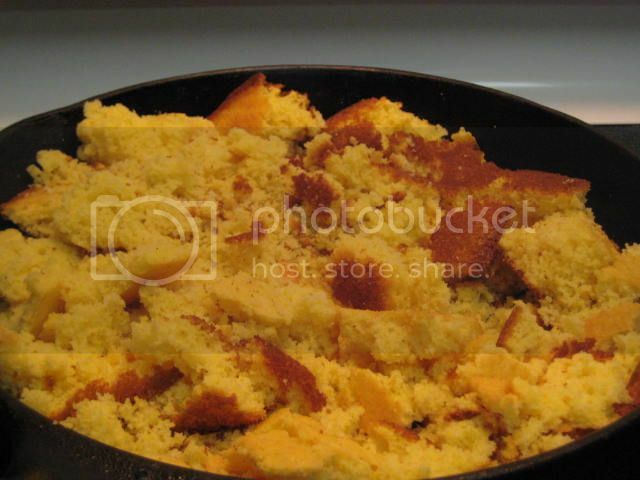 My dad's mom was from Virginia, and she used to make homemade cornbread with breakfast sausage crumbles (OMG!). So, I was led by memories to your blog. 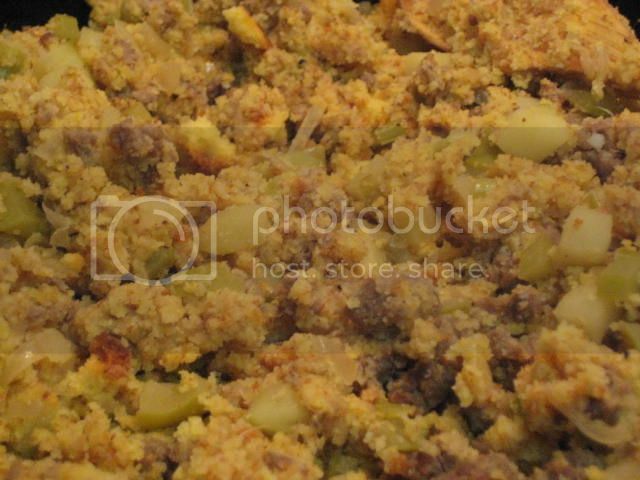 Thanks for reminding me of how ridiculously easy it is to make cornbread dressing. 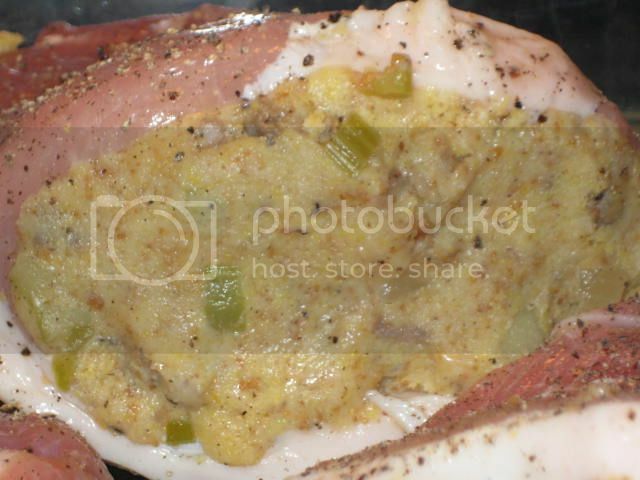 My local supermarket used to sell apple cornbread dressing stuffed pork chops but they've stopped. Now, I can make them myself. Thanks so much! Looking for your Twitter info right now.